A topical mineral coolant gel. Aids in the fast relief and reduction of inflammation, swelling and muscle soreness. CONTAINS BENZOCAIN – will test. REQUIRES A COPY OF YOUR DRIVER’S LICENSE TO PURCHASE PLEASE FAX A COPY TO 337-234-2383. A topical pain reliever that really works! 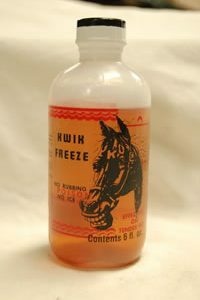 The greatest topical pain reliever ever formulated for the equine. Works immediately upon application. Will not blister or scurf. Effective on several forms of degenerative joint disease. Specifically formulated for performance application. No twitch, needles, or chance of infection. Literally, blocks the pain. Relieves sore soles 6 fluid oz. A penetrating solution which temporarily relieves muscular pain, soreness and stiffness, especially during periods of extensive training. Also reduces tenderness in the foot. 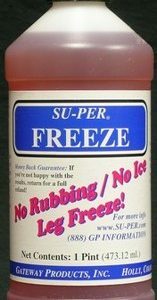 NO RUBBING, NO ICE LEG FREEZE! A fast-acting, deep-penetrating preparation which quickly cools and soothes knees, ankles, and shins. May be used before racing. Mix with water, do not use full strength. Clean legs thoroughly. Mix in the ratio of 1 pint per 2 gallons of tap water. Saturate “cold water bandages” and apply two hours before relief is desired. Keep bandages wet with solution. After washing off, legs may be wrapped. Painaway™ is guaranteed to stop the pain in minutes! Massage Painaway™ into the horses knees, shoulders, hocks, stifles, back or anywhere pain and soreness exists for instant relief. By relieving the soreness and discomfort your horse will be able to compete at it’s fullest potential. 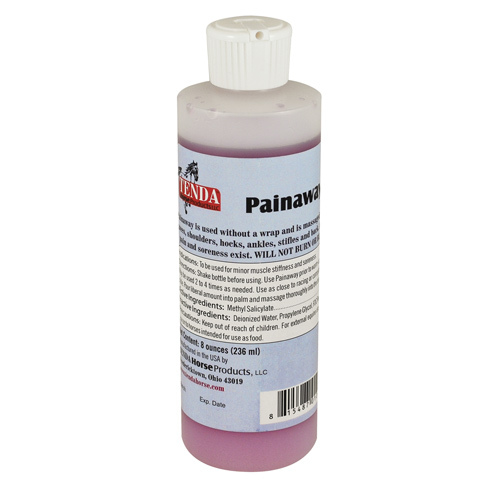 Painaway™ is suitable for all classes of horses and will not test.